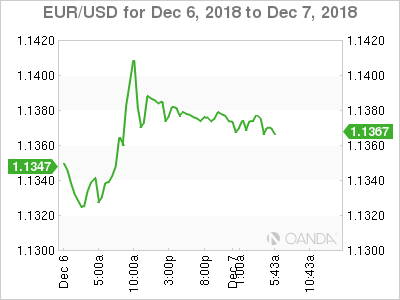 EUR/USD is almost unchanged in the Friday session. Currently, the pair is trading at 1.1375, down 0.01% on the day. It’s a busy day for economic indicators on both sides of the pond. German industrial production disappointed with a decline of 0.3%, shy of the estimate of 0.5%. Later in the day, the eurozone releases employment change and revised GDP for the third quarter. Both indicators are expected to dip to 0.2%. In the U.S, the focus in on employment numbers, highlighted by wage growth and nonfarm payrolls. The week wraps up with UoM consumer confidence. Nervous investors continue to fret over the U.S-China trade war. There was some optimism early in the week after President Trump agreed to suspend further tariffs against China for 90 days. However, there are concerns that the two sides will not be able to close the gaps in their positions in just a few weeks. The markets soured on Thursday, after a senior Chinese executive, Meng Wanzhou, was arrested in Vancouver for allegedly violating trade sanctions against Iran. Wanzhou faces extradition to the U.S., and China’s indignant response to the arrest could torpedo upcoming trade talks between the two countries.